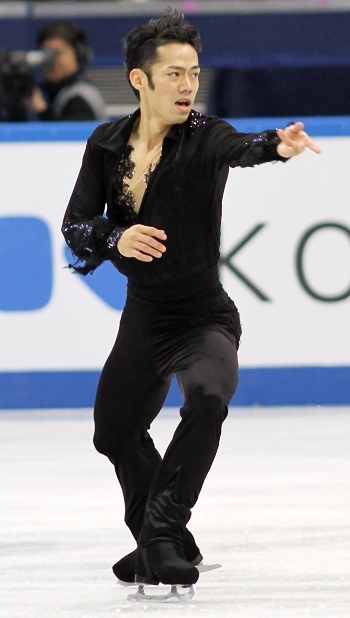 Japan’s Daisuke Takahashi performs to “Pagliacci” at the 2012-13 Grand Prix Final of Figure Skating. Daisuke Takahashi is Japan’s most decorated male skater in history and has just added another historic title to his impressive resume: He became the first Japanese man to win the ISU Grand Prix of Figure Skating Final earlier this month. His other “firsts” include: first Japanese man to win Worlds (in 2010), to take an Olympic medal (bronze in 2010), and to become World Junior Champion (in 2002). In Sochi, on Olympic ice, the now 26-year-old took another step towards his ultimate dream, the Olympic gold medal. His victory in the Final should give him confidence, but Takahashi, as always, does not give a simple answer. But for the Olympic bronze medalist, the most important moment about his free skating in Sochi was that he landed the second quadruple toeloop. A record number of four Japanese men (plus Canada’s Patrick Chan and Spain’s Javier Fernandez) competed in the Final, and Takahashi was the oldest skater among them. After his lead in the short program he jokingly said that he doesn’t want to lose against the “younger guys”. While he didn’t lose to them, he feels that he didn’t really beat them either. It’s not just about winning or losing for the multi-Japanese champion. His next stop is the Japanese Nationals that will be held this week in Sapporo. “I hope to enjoy the venue and the atmosphere at Nationals,” he added regarding his preparations. He’ll face Yuzuru Hanyu, Takahiko Kozuka and Tatsuki Machida who were with him in the Final, plus other competitors at Nationals. Takahashi not only wants to secure his spot on the World team, but also hopes to be able to compete in the Four Continents Championships in February as they are held in his hometown of Osaka. This spring, Takahashi caused a little stir when he and Nikolai Morozov announced that they would renew their collaboration. Takahashi trained under Morozov until 2008, but then they split, and not in the most amicable way. The Japanese skater is continuing to work with long-time coach Utako Nagamitsu as his main coach, but also works with Morozov in training and in competition. Takahashi is not sure at what percent his current ability is. Takahashi enjoyed his experience in the Olympic venue at the Grand Prix Final in Sochi. And he felt inspired by being in Sochi. “I must say by knowing this venue, I started to feel a little bit that I would want to come back here. I won’t deny that this (feeling) exists,” the Japanese skater noted. “Of course, ideally, it would be nice to retire here (in Sochi),” he revealed. This has to do with the fact that Russia holds special meaning for him. And what does he want to do once he retires? However, he doesn’t see himself as a show skater. “I won’t have much focus on my skating anymore (when I retire),” he explained.